When Seinfeld’s Frank Costanza yelled, “Serenity now!” he wasn’t decorating his master bedroom with an en suite. But judging by the products in today’s home market, that’s just what most merchants are selling: a luxe spa hotel experience for one’s own home. And, directed at modern customers who seem to be hooked on HGTV, today’s offerings are hitting their mark. The U.S. home textiles are estimated to be a $22 billion market, according to Home Textiles Today. Add to that, the bedding and furnishings markets are expected to grow consistently through 2017, according to the International Sleep Products Association (ISPA). The trade group forecasts the value of bedding shipments will increase 6.5% over the next two years, while bedding units will increase 4 percent. ISPA has also stated that “mattress involved” consumers—those who are slightly younger and have higher incomes than their counterparts—are more likely to buy new accessories like pillows, mattress pads and sheets when they buy a mattress (55 percent). So what do consumers want? Eighty-one percent prefer their sheets to be made of cotton and cotton blends, according to the Cotton Incorporated Lifestyle Monitor Survey. Following far behind are silk (3 percent), satin (2 percent), flannel (2 percent) and linen (1 percent). 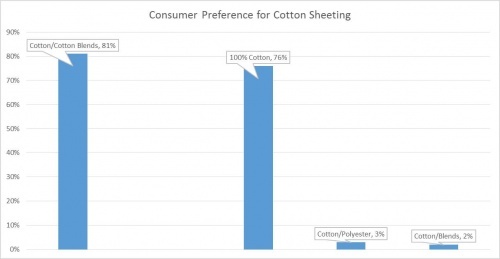 In fact, the majority of consumers are bothered by fiber substitution away from cotton in their sheets (58 percent) and are willing to pay a premium to keep their sheets cotton-rich (56 percent). Pat Tunsky, creative director at Doneger Creative Services says today’s consumers are leaning toward a newer feel in their bedding. Consumers say they purchase sheeting approximately once every two years, according to the Monitor. And nearly six out of 10 (59 percent) say softness is very important to their decision, followed by price (55 percent), durability to laundering (54 percent) and how long the sheets last (53 percent). When it comes to bedding (covers and duvets) purchases, 63 percent of shoppers say the ability to wash at home/cleaning requirements is very important to their decision, followed by softness (57 percent), durability to laundering (55 percent) and the life of the bedding (54 percent), according to the Monitor. Just 43 percent say color or pattern is important. However, the Monitor data shows almost half of all consumers (48 percent) get home textile ideas from store displays, followed by themselves (44 percent), online (30 percent) and magazines (23 percent). And almost two in three consumers (65 percent) say they shop for home textiles at mass merchants, followed by chain (40 percent), department (29 percent) and specialty (28 percent) stores. A video created for the Well Being 4.0 theme incorporates Pantone’s colors of the year: the soothing Serenity (light blue) and Rose Quartz. And the Well Being exhibit featured colors that ranged from tranquil to “vivacious.” So while romantic florals, geometrics and bold themes will be part of the upcoming fabric mix, non-fussy bedding is still key. The show also featured bedding that had tech features like multi-zone covers that promote an even-heat sensation, ergonomic topstitching that produces an optimal sleeping position, as well as covers that release aphrodisiac scents like cinnamon and ylang ylang when rubbed. Tech properties are actually sought by a number of today’s shoppers. Consumers look for moisture wicking/moisture management in their sheets (40 percent), as well as bacteria resistance/anti-microbial properties (39 percent) and temperature control (39 percent), Monitor data shows. When purchasing sheets, the most common features shoppers look for are brands that don’t pill (53 percent), little/low-linting (52 percent) and wrinkle resistance (51 percent), according to the Monitor. When shopping for bedding, 56 percent look for features like fade resistance, followed by stain resistance (55 percent), wrinkle resistance (54 percent) and no pilling (54 percent). The younger shopper—those aged 13 to 24—are significantly more likely than those aged 56-to-70 to look for features like quick-dry (48 percent versus 36 percent), temperature control (52 percent compared with 35 percent) and moisture wicking (42 percent as opposed to 29 percent). Tunsky says another trend has emerged in bedding. She says consumers are also purchasing throws, the perfect casual accent for their relaxing, personal retreats.